The clue I had been hoping to find ended right there, but these words did not go away. They gave me another story that weighed heavily on me. A few weeks ago, I did not know there was, or had been, such a person in the world, and today I wanted to know his story. 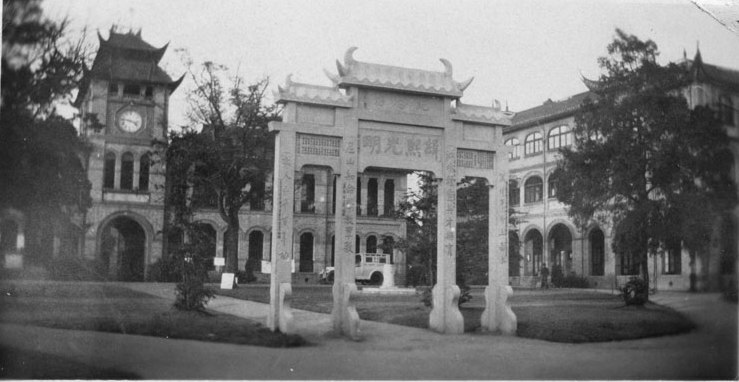 St. John’s University in Shanghai. I could easily imagine an elegant young man, a new college graduate, in light-colored suits, as was the fashion of temperate Shanghai, in the early 1940s, overly cultured for his age, a kind of men we only had glimpses of from faded black and white photographs. In the China I grew up, they had gone extinct. Not only the clothes were different, the expression, the posture, the voice and the words, and the way people carried themselves, had all changed. The sky was invariably gray, when I close my eyes to recall my childhood, and everyone had an alert, suspicious and fearful look in their eyes. These memories, of course, were not factual in the sense of record: the sky was not gray everyday, nor was everybody like that, at least not all the time. But who can say the natural deposit of memory, and whatever processing it has gone through following its own intrinsic logic, has no claim on truth? Might it even be truer than the facts? “Remake” was one of the most frequently used words of that era, and “remaking” was ubiquitous: industry, agriculture and business; cities, buildings and people; thought, language and writing, everything and every moment; visible and invisible. When I started remembering things, this remaking had only been carried out for less than two decades but had already done such a thorough job that it was nothing short of a miracle. 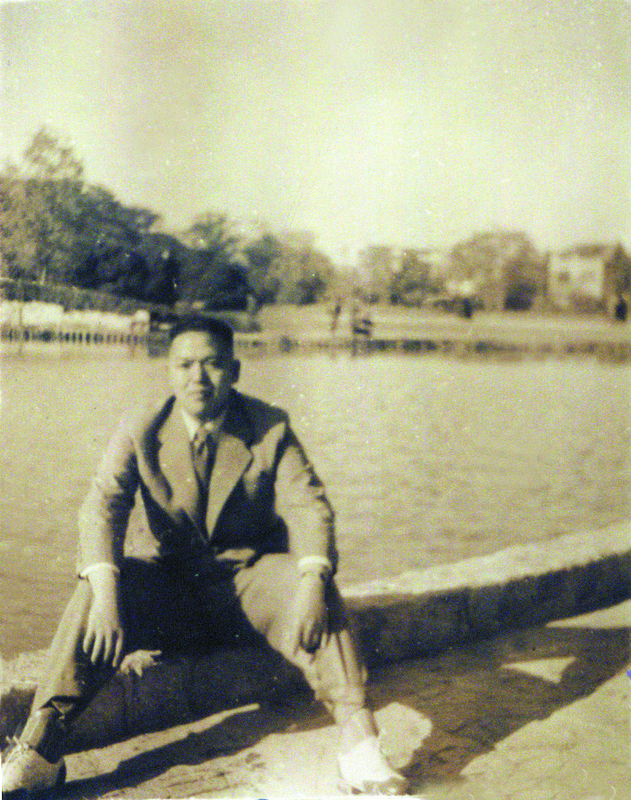 Sheng Shuren in 1948: On a visit to family home in Ningbo. The author didn’t receive this and the other photos of him until this piece had been written. On the phone with Erjia, Uncle Erning’s youngest brother, a few days later, I mentioned the name Sheng Shuren regretfully. Even more surprised, I urged Erjia to tell me everything. It turned out that Erning and Sheng Shuren stayed in touch after they were sent back from Xushui to their respective hometowns at the end of 1960, Erning to Anshan in the northeastern province of Liaoning and Sheng to Shanghai. Too tired from toiling long hours in the fields everyday, Uncle Erning sometimes would ask Erjia to write on his behalf. After a while, Uncle Erning grew withdrawn, and it was Erjia, a mailman, who kept the correspondence with Sheng going and the latter sent his greetings to Uncle Erning at the end of each of his letters. For years, the food supply was rationed in China, and in Liaoning Province, it was a combination totaling 12.5 kilos of wheat four, corn meal, rice and sorghum flour, per adult per month. Shanghai was one of the few places in China where you could buy food tickets relatively cheaply on the black market. For years, Sheng Shuren and Erjia kept a trade of food tickets: Erjia sent money to Shanghai, Sheng Shuren bought food tickets for Erjia, thus solving the chronic food shortage of the Liu brothers. In 1964 or 1965 when Sheng Shuren remarried (his wife had divorced him), he sent Erning an invitation, but Erning didn’t go. 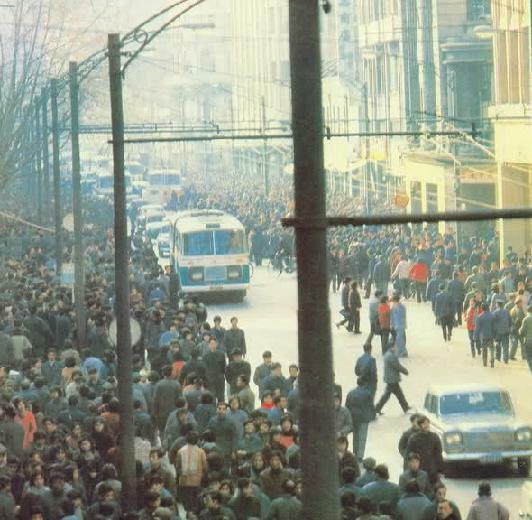 In the summer of 1972, Sheng Shuren wrote that the water pipes in his house were old and broken, asking Erjia if he could help him buy pipes in Anshan, one of China’s steel capitals. Although the house his family had lived in for many years was public property, it didn’t belong to a particular work unit, so there was nobody to call on to do the repair, and he had no place to buy pipes to try to fix them himself. He provided the numbers of pipes, elbows, joints and faucets he needed and their specs. Having purchased the 20 plus pipes, each a little over a meter long, Erjia embarked on a trip to Shanghai to deliver the goods and also to visit the great city. He made two train transfers to the port city Dalian, there he was able to purchase a ticket for economy class for nine yuan without trouble. It was “without trouble” because you couldn’t go to Shanghai just because you wanted to, and, in Erjia’s words, “if they didn’t like you, they wouldn’t sell you a ticket!” At the time, Erjia was only in his late twenties, handsome, wearing the green postal uniform, and must have looked “pleasant” enough to the eyes of those people. (When I first saw an old picture of the seven Liu brothers, I took immediate notice of Erjia, despite the shabby, dull clothes of that era.) He slept on a bench on the dock for a night. All around him, groups of sent-down youth talked loudly and incessantly in Shanghai dialect, waiting for the ship too to go home for a visit. The next day Erjia boarded a steamer, sailing a day and a night off the east coast of China before arriving in Shanghai. Sheng Shuren picked him up from the dock and the two dined in a restaurant on two dishes and one soup. The first evening Erjia arrived, members of Shanghai Workers’ United Front visited Sheng Shuren’s house to “check his resident registration.” Why haven’t you reported you have a visitor? They asked Sheng. Sheng answered: He has just arrived today and I have not had a chance to report. Then they questioned Erjia thoroughly: Where do you come from? What is your relationship to Sheng Shuren? What is the purpose of your visit? Erjia answered honestly: I am here to visit an old friend and also seek treatment for my rheumatism. Perhaps the Workers’ United Front felt that a mailman of the People’s Postal Bureau (that was the description on Erjia’s work ID) was one of their own, they let him off without further ado. Upon leaving, they ordered Sheng Shuren to submit a visitor report the following day. Erjia said, at the time, he thought Sheng Shuren was a normal person after returning to Shanghai and it didn’t occur to him that, just like his older brother, he was still an “object of the people’s democratic dictatorship” and the security people would descend on his house in response to the merest rustle they heard. By T in Uncategorized on June 25, 2012 . When I read your Posts like this one. I want to respond but words seem so inadequate. So I’ll just say thank you Yaxue. I look forward to reading more from you.